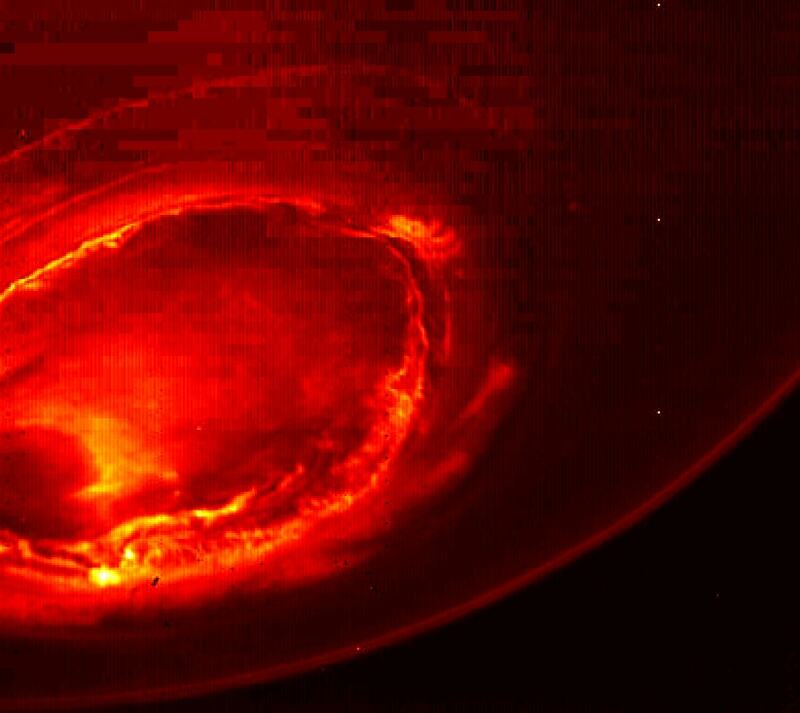 It is the first image released from the Jovian Infrared Auroral Mapper (JIRAM), an instrument contributed by the Italian Space Agency (ASI). It shows the southern auroral oval in great detail. From Earth, it is very hard to observe the southern aurora, due to the slang viewing geometry of Jupiter’s poles, so this humankinds first ever good view of it! There are clear filaments and a surprising amount of activity. We are likely to be trying to understand this image, and the ones to follow, for a long time. The emission is generated by the molecular ion H3+. It is produced when either ultraviolet sunlight or energetic electrons impact molecular hydrogen (H2), stripping away an electron. H3+ is the very simplest polyatomic ion and we can use it as a remote diagnostic, examining the physics and the interactions of the aurora at Jupiter. By dividing the infrared light from H3+ into different wavelengths producing a spectrum and measuring the ratio of one part of the spectrum to another, we can directly measure the temperature of the aurora. It’s a little bit like sticking a thermometer into the atmosphere of Jupiter, and just like with humans, the temperature is an excellent diagnostic of the state of the atmosphere. Because of the aurorae, the polar regions are hot, and we’d like to figure out how this energy moves to lower latitudes.